The fury began Oct. 22 when meteorologists at the National Hurricane Center in Miami picked up a tropical depression forming off Nicaragua. At first blush, there was nothing unusual about it, but in a matter of hours the low-pressure system strengthened into a tropical storm, the 18th of the 2012 Atlantic hurricane season. A week later, New Jersey, New York and Connecticut would take a decimating hit from a vicious post-tropical cyclone dubbed Superstorm Sandy. On its way up the East Coast, what was then Hurricane Sandy combined with another strong low and quickly morphed into one of the largest storms ever to form in the Atlantic Basin. A high-pressure system that stalled offshore turned the storm northwest, and it made landfall early on the evening of Oct. 29 just south of Atlantic City, N.J., with catastrophic storm surges and maximum sustained winds of 81 mph, according to the National Hurricane Center. Peak lunar high tides, ferocious easterly winds and record-low barometric pressure near the storm center created ideal conditions for storm surges in excess of 10 to 12 feet near New York Harbor and on the west end of Long Island Sound, and from 5 to 8 feet from southern New Jersey to western Rhode Island. As forecasts for prodigious surges hit the airwaves prior to Sandy’s arrival, anxious boat owners frantically called their marinas. Many boats had already been hauled and winterized, and many others were still commissioned and in the water. 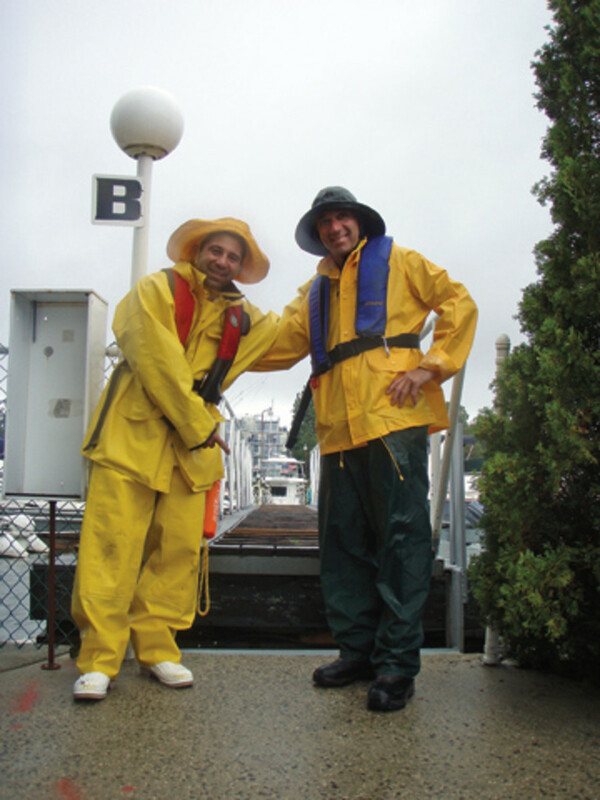 Marina owners swung into action, hauling and blocking some boats and securing others to floating and fixed docks. In the face of such a powerful storm, there was little else most marina owners could do. 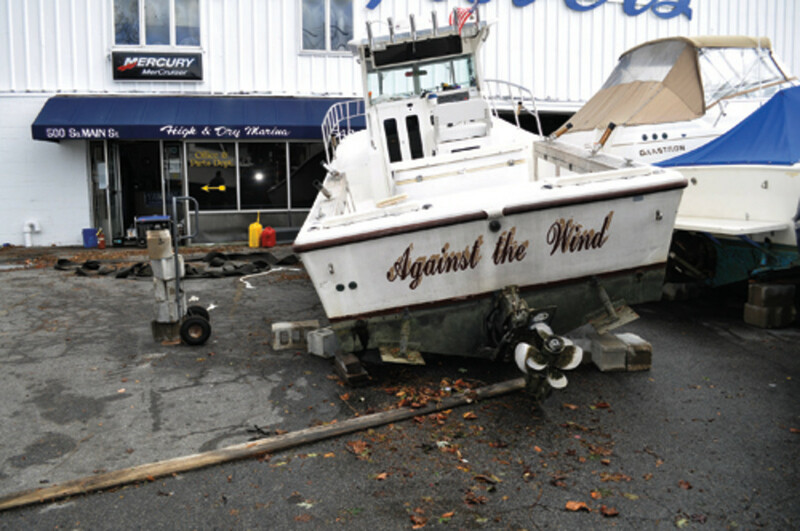 Photographs of boats in piles hit the media as early as Oct. 30, the day after the storm. Naturally, boat and marina owners were devastated. CAT (catastrophe) response teams from BoatUS were on the scene within 24 hours of the storm, according to Beth Leonard, director of technical services for BoatUS in Alexandria, Va. The CAT teams remained in the field for two months, assessing the damage, processing claims, and studying the practices and procedures marinas employed or did not employ to mitigate losses. The CAT teams found three marinas in the hardest-hit areas that had significantly less boat damage than their neighbors. The owners defied conventional thinking, trying what some might have considered radical storm tactics when the chips were down. Here are their stories. 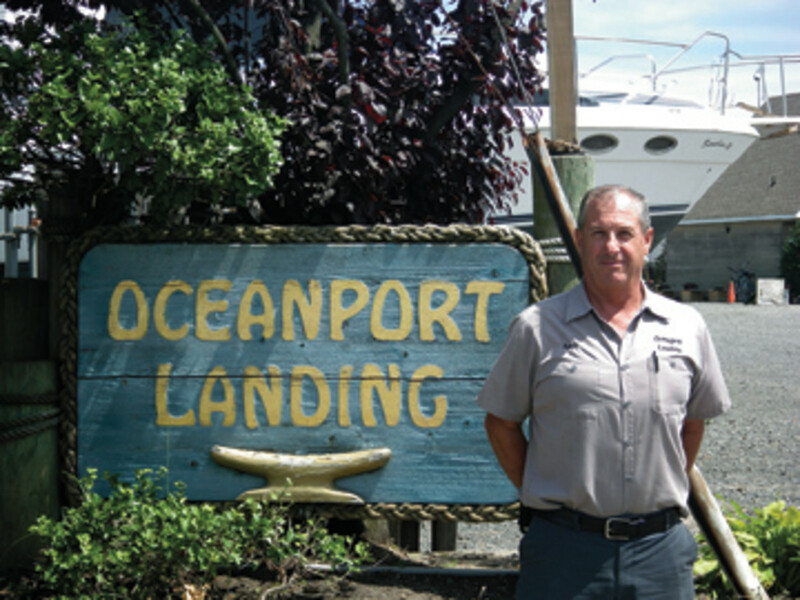 Keith Seeley, 57, co-owner of Oceanport Landing, stood in front of his office and service shed and stared blankly at the high-water marks he’d just drawn on the exterior of the buildings. The predicted storm surge of 12 feet or more from Sandy would inundate his boatyard, most of which sits 7 feet above sea level. The buildings are just 2 feet higher. As Seeley visualized a nearly unprecedented high-water event, he knew he had a serious problem. Controlled chaos ensued. Hauling and blocking efforts continued at an even faster pace. Seeley’s wife, Carole, co-owner of the 85-slip marina since the couple began operating it in 1983, methodically removed all documents and computers from the office, getting everything to high ground with the help of friends. It was Oct. 28. Sandy would arrive in full fury the next day. Racing against the clock, Seeley kept some of the yard crew on hauling detail, but he dispatched others to tie the 130 boats that were on the hard together into enormous raft-ups. He figured individual boats floating off jack stands would crash and bump until they sank, or they’d escape and head for England. A raft of boats, on the other hand, would give safety in numbers. To keep the boats from going on an undesired cruise, he and his crew tied them to the marina’s bulkhead, trees, telephone poles, bushes and buildings. The few big boats that were left in the water, including Seeley’s 41-foot Silverton, were secured with doubled lines and plenty of fenders. After doing a final walkthrough of the marina, Seeley and his wife drove to higher ground to stay with his brother until the storm passed. Sandy already was lashing the Jersey shore on the morning of Oct. 29, and conditions steadily worsened. “I went to bed that night thinking I was going to lose my house, my marina and my boat,” Seeley recalls. He didn’t sleep much. At 3 a.m. Oct. 30, he got into his truck and drove toward the marina. The tide was on the ebb, and he wanted to assess the damage. Headlights cut through the black night. Power was out everywhere. The wind screamed. The truck shook. As he approached the road to the marina, a local cop pulled him over. The entire area was under mandatory evacuation orders. Seeley shouldn’t have been there. Oceanport is a small town, and Seeley knew the cop. He told him where he was going. “You don’t want to go down there, Keith,” the cop said. The cop reluctantly let Seeley proceed. The day after the storm, Seeley says, he and his team got to work right away to clean up the mess. Miraculously, no boats were sunk or destroyed. None left the property, whereas some marina owners returned to find no boats or piles of wreckage. In one case, Seeley says, a boat was found five miles from its marina. The extent of the boat damage at Oceanport Landing amounted to dings, twisted railings and scratched gelcoats. No prop shafts were even bent. The boats went up together, took a tethered cruise around the yard and came back down. The wave action chewed up the floats, but the fixed docks were relatively undamaged. The big boats in the slips came through “without a scratch,” including Seeley’s Silverton. Seeley’s house survived, too. Dante Grover, 52, owner of Al Grover’s High & Dry Marina, about six miles east of Far Rockaway, N.Y., slowly throttled the forklift forward against the tin wall of his 28,000-square-foot dry-stack warehouse. The fork was raised to about 15 feet, or half the height of the 30-foot-tall, 200-foot-long wall, and the forks were spread to the widest setting. Gusts exceeding 70 mph threatened to peel the wall away, and Grover was determined to save his building and the 140 powerboats stored on the racks inside. Sheets of horizontal rain reduced visibility to zero. Grover could hear practically nothing but the roar of Sandy, even though the forklift’s diesel was usually loud enough to wake the dead. The wall in front of him billowed out like a sail when the hardest gusts hit as he inched the forklift forward until the forks were planted like buttresses to reinforce the tin sheeting. He shut down the engine, knowing there was nothing more he could do. It was about 10 a.m., Oct. 29. For the past several days, Grover and his crew had been hauling boats non-stop in preparation for the storm. Every available space in the yard was filled, amounting to more than the 150 powerboats Grover usually stores outside during the winter. There wasn’t an inch of space left, so some boats were still on the floating docks, with anchors deployed as far out in the channel of Freeport Creek as possible. Great South Bay and Jones Inlet lay to the south. The storm surge was expected to exceed 11 feet. The next day, Grover discovered the extent of the mess. He says about 80 to 90 boats floated off the blocks and “went for a little ride.” A 36-foot Grady-White crashed through a cinderblock building. About 10 boats took a cruise through the fences adjacent to the property, but thankfully they didn’t go far. All of the buildings were flooded. The office had 5 feet of water in it, and about 3 feet of water entered the dry-stack warehouse, which lost roughly 50 feet of the wall where Grover had parked the forklift. No boats in the building were lost. The boats that were blocked high and had the drain plugs in suffered only “scratches, dents and canvas damage,” he says. None was a total loss. Many of the boats that had been winterized and had the drain plugs out were total losses. In all, Grover says, he had roughly 70 percent fewer total losses than other marinas in the area. John A. Giacobbe, 33, corporate counsel and manager of the Imperial Yacht Club, struggled to stand against the raging wind just after midnight Oct. 30. Sandy had shrieked ashore in New Jersey four hours earlier, and the surge at the far western end of Long Island Sound had come in strong at over 10 feet with the rising tide. Slack high water was at 12:11 a.m. Some of the floating docks were up over the tops of the pilings, riding the special I-beams he had fabricated and installed after Hurricane Irene, which hit New York as a tropical storm in August 2011. Irene killed at least 45 people and caused more than $7.3 billion in damage, according to NOAA, and by all appearances Sandy was going to be much worse. As terrible as Irene was, Giacobbe, in a sense, was grateful. The storm taught him valuable lessons. The marina, which sits 8 to 10 feet above sea level, may have been well protected behind Davenport Neck, but it was vulnerable to surge. The docks of Giacobbe’s 110-slip marina floated to within a foot of the top of the pilings during Irene. That prompted him to take preventive measures to guard against another surge event in the future. The steel I-beams extended the “sticks” by 3 to 5 feet. They were designed with a taper to allow the bullrings at the end of each finger dock to easily slide from the piling, up the bar and then back down again. He also designed an anchoring system for the floats to keep them in place. It consisted of rings of chain fitted with sections of pipe that acted as rollers. The chain rollers were shackled in place on designated pilings under the bullrings. Then a heavy line was run from the chain roller to the main float and lashed using a hole drilled through the frame of the dock, avoiding the use of cleats, which “like to rip out,” Giacobbe says.